The 2300N95 exhale valve particulate respirator is suitable for most welding applications. The exhale valve reduces hot air build-up, making breathing easier and keeps workers cooler. The exclusive dura-mesh shell protects the filter media so it stays cleaner-looking longer. 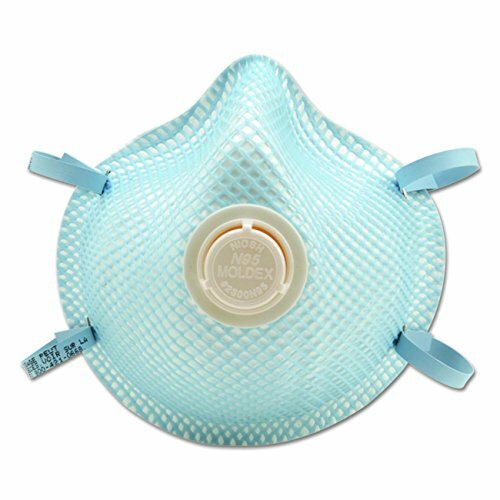 The shell resists collapsing, even in intense heat and humidity, allowing the respirator holds its shape longer resulting in fewer respirators and lowered costs. The contour molded nose Bridge with soft foam nose cushion provides the wearer an easy, comfortable fit. There's no metal noseband to adjust and the seal is maintained without pressure points. Soft spun lining gives added comfort and durability. The mist respirators are available in two sizes to fit most workers in today's workplace and are niosh certified to have a filter efficiency 95% or greater against particulate aerosols free of oil. This product meets heat and flame resistance in accordance with ANSI/ISEA 110-2003 Section 7.11.1. If used for welding, be sure to wear appropriate eye and face protection. (100% PVC free). If you have any questions about this product by Moldex, contact us by completing and submitting the form below. If you are looking for a specif part number, please include it with your message.